From smog-choked cities to sludge-filled rivers, stories about China’s environment in recent years have painted a bleak picture. But China is not the first country to put economic development above protecting the environment. All of today’s wealthy countries, including the UK during the industrial revolution and the US after World War II, got rich doing the same. What’s different about China is the pace of development, the scale of its impact, and the timing. Never in human history have so many people been pulled out of poverty so quickly. China’s unprecedented development, which has relied on fossil fuels to the point that the country is now the world’s biggest emitter of greenhouse gases, comes at a crucial time for the world. If we don’t reduce greenhouse-gas emissions to zero by 2060, we’ll be staring down the gun at climate menaces humans have not faced in our time on the planet. The good news is that, unlike the US, the world’s second-biggest emitter, China appears truly committed to climate action. The country has pledged to hit peak emissions by 2030, and to ensure emissions fall rapidly after that. These commitments aren’t just posturing. China has been the world’s largest market for renewable energy for a few years now. In 2006, the country had 100 MW of solar-power capacity and 2,600 MW of wind-power capacity installed. Merely 10 years later, those figures were 77,800 MW and 159,000 MW—a 778- and 61-fold increase, respectively. For comparison, in the US—still a much a richer country than China—there was 40,000 MW of solar-power capacity and 90,000 MW of wind-power capacity in 2016. Sinopec-owned coal power plant in Dongying, China. China, though, still must grapple with the reality faced by any developing economy in the 21st century. The country’s growing demand for energy is outpacing its ability to replace dirty sources like coal with clean, renewable ones. While the construction rate of new coal-fired power plants has slowed, it hasn’t stopped altogether. Further, even if China stopped building new coal plants tomorrow, the country has come to so deeply rely on this dirtiest of fossil fuels—more than 70% of its electricity currently comes from coal, compared to about 40% in the US—that it would continue to emit significant greenhouse gases for years to come. China’s energy demand is so high right now that it simply cannot afford to stop burning coal and other fossil fuels. These contradictions make China the perfect case study for large-scale deployment of carbon capture and storage (CCS). Experts say that if there’s any country that really needs this technology, which enables power plants to burn coal or natural gas without putting carbon dioxide emissions into the atmosphere, it’s China. Better still, they insist, thanks to a heavy-handed government and large state-owned enterprises, if there’s any country that can pull it off at mass scale, it’s China. This past July, I spent two weeks in the country to find out whether these arguments could be backed up by the reality on the ground, and to see if CCS technology had started to take hold in any meaningful way in the country. This article is part of The Race to Zero Emissions series investigating carbon-capture technology. You can also read our feature laying out the case for using the technology to fight climate change. Carbon capture is a stopgap technology, meant to get us to a point when we will be able to generate, store, and supply the entire world’s energy from renewable sources alone. Crucially for China, the world’s manufacturing hub, CCS can also reduce the emissions of certain industries, including cement, steel, and ethanol, which have no other option but to emit carbon dioxide because of their inherent chemistries. China has been experimenting with the technology for at least a decade, and currently has nine carbon-capture projects in pilot stage. They’re relatively small, and don’t always run. Their main purpose is to test the limits of the technology, and use the lessons to build large-scale projects, which can capture on the order of magnitude of 1 million metric tons of CO2 annually. In May, China announced—to much media fanfare—it had begun building a large-scale CCS plant near the city of Xi’an, in the center of the country. Or rather, it would be scaling up a pilot project already in place at a coal-chemicals factory run by the state-owned enterprise Yanchang. Right now, the project captures 50,000 metric tons of CO2 per year, and trucks the gas to a site 140 km (about 90 miles) away, where it is injected underground; the plans are to build out capacity to 400,000 metric tons, and install a pipeline to make transportation cheaper. I had asked to visit the pilot plant and construction site, and in June, I was told to send a formal request. I did, but after a month of back and forth, Yanchang told me “no.” “China is a hard place to understand,” Alex Zapantis, former general manager of Asia Pacific at the Global CCS Institute, warned me before my trip. He was right. Despite months of advance planning, I hit roadblocks at every stage of the trip—this was just one of many. Later, I would learn that though Yanchang had announced its big plans, it hadn’t yet secured all the environmental permits and government funding needed to actually start construction. Yanchang’s decision to deny my visit request without giving me the real reason made me skeptical about China’s seriousness in developing carbon capture. So did the fact that carbon-capture experts working in China don’t always trust information coming from Chinese companies and government agencies. The distrust is reasonable, considering economists around the world remain skeptical about China’s official quarterly gross domestic product, probably the most important economic data point published by Beijing. I had other trustworthy sources, including Zapantis and Bruce Hill of Clean Air Task Force, telling me China is moving forward in earnest with major carbon capture projects. But I needed to see at least one in person. Despite dozens of emails and phone calls in the weeks leading up to my trip, I could not get anyone to confirm they would let me visit a carbon-capture facility when I arrived. My hope was that being there in person would help make the case better. So in July, I flew out with little more than fingers crossed. In China, I met academics, industry professionals, policy wonks, and government officials all working in the space. Every time, I ended the conversation with one last question: can you help me secure a visit to a carbon-capture plant? As my limited time flew by, I began to rearrange this story in my mind, creating a version where all I had to go on was the word of handful of experts (as trustworthy as they might be). Three different oil companies had declined my entreaties, and none of my sources were optimistic. Just two days before I was due to fly back, the perseverance paid off. It was a sweltering hot day in July in Dongying, a city about five hours southeast of Beijing. In the time it took to walk from my bus stop to a taxi about 60 meters (200 ft) away, I was drenched in sweat. When I reached the offices of Sinopec, one of China’s biggest oil and gas companies, I was greeted by Lu Shijian, a senior engineer responsible for the company’s CCS projects. He had an air-conditioned car running, ready for the journey ahead of us. Our first stop was the Sinopec-owned coal-power station on the outskirts of the city. Lu gave me a tour of the carbon-capture pilot installed there, which takes the exhaust gas from the power plant, separates the carbon dioxide, and then compresses the gas for transport on trucks some 80 km (50 miles) to the injection site. The plant captures up to 40,000 metric tons of CO2 a year. At the time I visited, the plant wasn’t running. That wasn’t necessarily a red flag; pilot plants are mainly meant for testing. Carbon dioxide is being injected into Shengli oilfield. Next stop: the injection site. The city of Dongying is built atop the Shengli oilfield, the country’s second largest, but it wasn’t until we left the city that I could actually see any evidence that the oil industry had been extracting natural resources from beneath the earth here for half a century. Amid pear and persimmon orchards, I spotted a patch of empty land with a lone pumpjack nodding its head up and down. The pumpjacks multiplied as we drove on. But many stood immobile in the fields. The exploitation of the Shengli oilfield began in 1966, and production peaked in the 1990s. Yield from the ageing, depleting oil field has been declining since—which is why so many pumpjacks weren’t pumping when I visited. But there is one way to increase the field’s yield: pump in carbon dioxide. Oil is typically trapped in porous rock underground, and liquefied carbon dioxide can act like detergent to extract it. The carbon dioxide ends up stored in the oil well, deep below the ground, safe there for thousands of years. Oil companies typically monitor for leaks in the years following injection, but in the decades we have done this leaks occur rarely. Overall, the process (called “enhanced oil recovery”) is better for the environment than simply extracting oil through other means. The actual injection site looked dull (and I had been warned it would be). It was a tennis-court-sized piece of land with tangles of pipes and pumps. In one corner, there were three 20-feet tall, white cylinders holding pressurized carbon dioxide. Under a shed was a series of compressors and pumps, which send liquid carbon dioxide through an odd-looking, red pipe structure. “That’s where carbon dioxide goes,” Lu said. “It then pushes oil out.” He turned around to point at a pumpjack at a distance of about 100 meters (300 feet), bobbing away, working to extract oil. 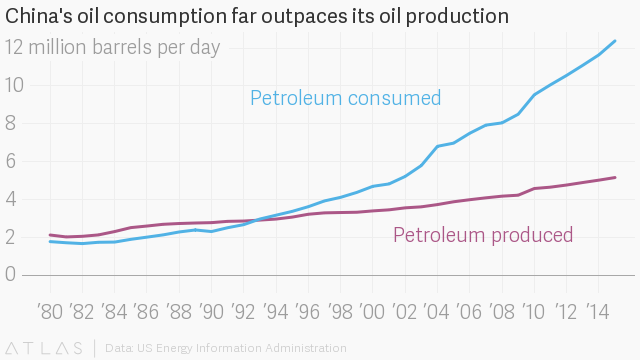 China’s biggest oil fields are all now producing far less than they did at their peak. The country’s largest, the Daqing oilfield, produced more than 1 million barrels per day in 2002. Now it yields under 750,000. Consumption, on the other hand, has kept increasing. China today uses more than twice the amount of oil extracted from its own oilfields; the difference is made up through imports. In the absence of other financial incentives to cut emissions, enhanced oil recovery is the biggest selling point for carbon-capture investment. But China’s unique situation makes carbon capture also attractive from an energy-security perspective: enhanced oil recovery is the cheapest and quickest way for China to increase its own oil production. Carbon-dioxide injection site among the fields of Shandong province. Carbon capture in China is real. In fact, the technology I saw at the Sinopec facility on the Shengli oil field was not very different from the ones I visited in Europe or North America. If anything, the Sinopec pilot plant looked old. It has been running since 2010. The power plant it was built on has space reserved for scaling up the technology to capture more than 1 million metric tons of CO2, Lu told me. “So what’s stopping Sinopec from building it?” I asked. Surely more captured CO2 means more enhanced oil recovery, and thus more money for Sinopec, right? One of China’s greatest strengths when it comes to developing technology lies in its governance system’s ability to execute large-scale, multi-industry projects, says Hill of the Clean Air Task Force. This is particularly valuable when it comes to carbon capture, since a carbon-capture project is actually five different projects packaged in one: generating carbon dioxide, capturing the emissions (which is a two-part process), transporting it to where it will be stored, and injecting it deep underground and then monitoring it. In any given North American or European carbon-capture project, there’s a pretty good chance at least two companies are splitting the five steps between them. Take the Boundary Dam project in Canada, which launched in 2014 and became the first coal power plant to do carbon capture: Emissions are generated by the power company SaskPower; the carbon-capture unit was built by Cansolv; and pipeline was built and is operated by the oil company Cenovus, which also injects the carbon dioxide to extract oil. When multiple companies are involved, the project can fall apart if any of the partners pulls out. Even if all parties stick with it, there are complicated relationships that have to be managed. At the Boundary Dam, for example, SaskPower ended up unable to capture the amount of carbon dioxide it had promised; as a result, the company had to pay out a fine to Cenovus. If it chooses to, China can do carbon capture differently than the west, says Xiaochun Li, a geology professor at the Chinese Academy of Science. Just as it has when scaling up most of its other industries, China could make use of its cheap labor, cheap resources, and low operating costs to make carbon capture flourish in the country. In addition, in China, all of the companies involved in a full-chain carbon-capture project would be state-owned. Though they still operate in a relatively open market, in theory if the government were to decide carbon capture is a priority then state-owned enterprises are likely to follow suit. Better still, because it’s the world’s maker of stuff, China is full of low-hanging carbon fruits to pluck. The exhaust gas from a methanol-producing factory, for instance, is nearly pure carbon dioxide. That means you could skip the expensive step of separating carbon dioxide from a mixture of gases, and simply compress and bury the gas underground. Carbon capture is not, however, a top priority in China, Sun Zhen, deputy director general of the Chinese government’s department of climate change, told me in July. Lu, the Sinopec engineer, said that’s partially because, though governments can nudge state-owned companies towards a given project, it also gets pushback if the project is financially unfeasible. Oil prices are currently too low to make enhanced oil recovery-based carbon-capture projects a smart investment. The break-even point for extracting oil from ageing fields in China is $50 (about 330 Yuan) per barrel, and with prices predicted to remain below $60 per barrel until 2020, Sinopec can’t afford to support a large-scale CCS project. If there was government funding available for CCS development and implementation, it could help companies like Sinopec clear those financial hurdle. There isn’t, at least right now. That has major implications for the trajectory of carbon capture in China. “CCS doesn’t enjoy fair competition against other technologies,” Sun said. Today, renewable energy projects receive major government support in the form of direct investment, tax credits, and even inclusion in policy frameworks. Carbon capture does not. In that regard, the problem in China is not unlike in the West. Renewables are considered additive: they add more capacity to generate power. CCS projects, on the other hand, seem subtractive: they cut emissions but also reduce power output because carbon capture requires energy. As China continues to grow into an economic powerhouse, it cannot afford to give up any of that precious energy. Carbon capture may be scientifically viable, but the financial challenges are still real. Without incentives to cut emissions, in the form of tax credits or a tax on carbon emissions, banks are unable to see a case where a carbon-capture project would make back the money invested. It’s a chicken-and-egg situation: If the cost carbon capture were lower, its mass deployment could be financially viable. To get there, we need to invest money to make it cheaper. Still, China is at an important crossroad. As the 2030 deadline creeps closer, if emissions don’t slow down, the country will have no option but to turn to carbon capture. A CCS roadmap prepared by the Asian Development Bank says that, by 2020, China needs enough projects to capture 10 million metric tons of carbon dioxide per year. Then, by 2030, the country’s annual carbon-capture capacity should reach 40 million metric tons of carbon dioxide. That would put China in a position to capture as much as 2.4 billion metric tons of carbon dioxide by 2050, which would be a major contribution to helping the world avoid catastrophic climate change. An official in the science ministry who didn’t want to be named told me that if China were to invest 100 billion yuan ($15 billion) between now and 2030, the country would be on track to hit the goals in the ADB’s roadmap. Those investments would enable China to develop the knowledge and expertise needed to implement inherently complex CCS projects. That sounds like a lot, but it’s really not. For comparison, in 2016 alone, China’s clean-energy investment (almost all for renewables) stood at nearly $90 billion. And of course, this isn’t just an investment in energy security; it’s an investment in a future where the Earth remains habitable for all humans, Chinese and otherwise. Historically, Beijing has used top-down policies to drive large deployments of technology in China. Recently, for instance, in a bid to cut emissions, the country implemented strict regulations on new coal power plants. Almost without exception, any new plant built must be “ultra supercritical,” where coal is burned at much higher temperature and pressure, producing fewer emissions per unit of energy. But the scale of the carbon-dioxide problem is such that China is also considering more market-friendly options, such as a carbon price. “It is something the government is keen to implement,” Sun Zhen of the environment ministry told me in July. Then on Dec. 12, at a climate summit in Paris, Sun’s words were echoed by his boss, Xie Zhenhua, vice president of the country’s top economic body, the National Development and Reform Commission (NDRC). Xie told the crowd of government and business leaders gathered in Paris that China would soon launch the world’s largest carbon market. The NDRC later confirmed the launch will happen on Dec. 19. Carbon markets can be implemented in many ways. The most popular is a cap-and-trade scheme, where governments set a cap on a facility’s emissions based on certain factors like the type of industry it belongs to and the ease with which the industry could feasibly reduce its emissions. Typically, the cap is reduced gradually each year to help the government reach its emissions goals. If the industry beats the government’s targets, it can sell any additional “saved” emissions on a carbon market. Other industries that failed to hit reduction targets can buy those saved emissions to artificially reach their goals. This incentivizes polluters to pollute less. China has been running trial versions of this kind of emissions-trading scheme in different provinces over the past few years. In Paris, Xie said China will bring all these trading schemes under one national umbrella, and deploy it to provinces that weren’t part of the trial. At first, the scheme will only apply to the electricity industry and the caps will be high, says Sirui Xiao, deputy director of the carbon market in the province of Guangzhou. That will keep demand, and, therefore, emissions-trading prices, low. But as the cap is gradually reduced, the carbon price should, in theory, go up. China, as the world’s biggest emitter of greenhouse gases in a world that needs to hit zero emissions, faces a huge task. Beijing’s ability to take a heavy-handed approach to the problem—an approach the west detests, for good reasons—is likely to be a huge advantage. It allows the country’s leader, Xi Jinping, to think long term and not worry about the next election cycle. That means Xi can implement policies like the carbon market that may not be popular with the electorate, but are good for his people and for the planet. Beimeng Fu helped with translation. The reporting was supported by a fellowship from the McGraw Center for Business Journalism at the City University of New York Graduate School of Journalism.